Cloud expertise to optimize your cloud strategy. Brian Hammond is a Sr. Regional VP with 15 years of experience in the information technology industry. 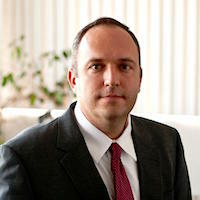 He joined the company in 2000 as a software engineer and has held a variety of positions with the company, including Consultant, Regional Microsoft Practice Manager, Account Manager for Toyota North America, National Microsoft Practice Manager, Geographic Vice President of Cincinnati, and Regional Vice President of Heartland. Prior experience includes Cincinnati Automation, Erlanger City Council, and North American Software. Brian holds a degree in Engineering from the University of Kentucky. The digital world is in the midst of a major cloud revolution and for good reason. The cloud offers scalability, responsiveness, and cost efficiency that have a tremendous impact on the way organizations operate and deliver products to customers. Successfully migrating enterprise applications to the cloud requires a comprehensive strategy, detailed planning, and strong technical execution. At Sogeti, you’ll find all three. Ensuring you have a strong foundation for your cloud architecture. Helping you develop a clear roadmap to adopt cloud technologies. Creating cloud-native apps that bring true agility to your business. Providing ongoing support to ensure long-term success. Our solutions are tailor-made to deliver the greatest value for your business. Cloud Strategy: We work with you to develop a cloud strategy that’s tightly aligned to your overall business goals, allowing you to maximize results. Plot your journey to the cloud with the experts that will put you on the path to success. Cloud Migration: You also need someone who understands the complexities of moving a major enterprise to the cloud. Our experts can make sure that you are following the most efficient migration path for your business and help you re-architect applications so that they are fully optimized. We’ll execute your migration to continuously drive improvements. Cloud-Native Applications Development: We can help you develop cloud-native applications that deliver the true agility you need to quickly adapt to a constantly changing digital environment. We leverage partner PaaS solutions and manage these platforms directly for our customers, accelerating your time-to-market. We also leverage a DevOps model to ensure our development is efficient and effective. Managed Cloud Services: This solution is a fully-managed, end-to-end private, public, and hybrid cloud service centered on helping improve performance, agility, application rationalization, scalability, and costs. Our production support includes 24/7 monitoring, customizable options for onshore/offshore support, onsite staff to ensure accountability, and expertise in managing monitoring services from every major cloud provider including Microsoft, Amazon, IBM, HPE, and Oracle. Our cloud portfolio is designed to help you put today’s latest technologies and innovations into action, transforming your software, applications, and processes into true competitive advantages. Contact us today to start optimizing the cloud and achieving results that are sky-high.